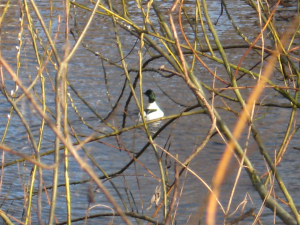 The male Goosander is a beautiful black and white duck with a dark green head. There have been Goosanders in the River Wharfe all winter, but males have been less numerous than females. There is a pair near Gallows Hill which seem to stay in a territorium. Goosanders have bred here in the last few years.